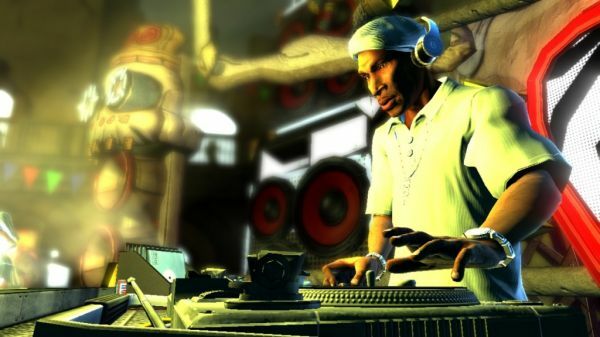 As music games go, DJ Hero has one of the biggest set lists out of the box we've seen to date. With almost 100 songs to play, you're sure to work up some arm muscles scratching discs on your plastic turntable by the time you make it through the full set. Activision has unveiled every song for the game, which will be available at the end of October on the Xbox 360, PlayStation 3, Wii and PlayStation 2. Songs that are playable in the DJ-Guitar co-op mode are marked and bolded. At anytime someone can plug in a microphone and MC over as well. Benny Benassi - "Satisfaction" vs. Tiësto - "Elements Of Life"
Daft Punk - "Da Funk" vs. N.A.S.A. - "Strange Enough ft. Karen O, ODB & Fatlip"
Gorillaz - "Feel Good Inc." vs. Blondie - "Atomic"
Kid Cudi - "Day ‘N' Nite" vs. Black Eyed Peas - "Boom Boom Pow"
M.I.A. - "Paper Planes" vs. Wale - "Lookin' At Me"
N.A.S.A. - "Strange Enough ft. Karen O, ODB & Fatlip" vs. Isaac Hayes - "Theme From Shaft"
Public Enemy - "Shut ‘Em Down" vs. Beck - "Where It's At"
Wale - "Lookin' At Me" vs. Black Eyed Peas ft. Tippa Irie - "Hey Mama"